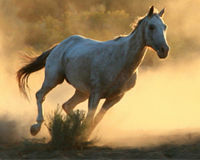 "Don’t Kill Our Wild Horses"
Sheryl Crow’s “I Don’t Wanna Know” featured in “Saving the American Wild Horse” Documentary. "Leave the venerable Colorado River be"
This aien’t Vegas, but it is a new twist on the planned community. Question: Which came first, the Casino or the neighborhood? Answer: neither, they were created simultaneously. The Aliante Hotel and Casino is the nucleus of the Aliante Home Community in North LasVegas. The hotel/casino site has 200 guest rooms, a 16 screen movie theater, six restaurants and a food court. The Aliante Hotel Casino plans an official opening at 11:11 pm on November 11, 2008. The Aliante community offers: restaurants, a golf club/golf shop, parks, shopping, (proposed) library, homes and 24 miles of lighted walking trails. exit. Head east on I-215, exit Aliante Parkway and proceed south. Call 702-631-0359. Open daily: Winter Hours – 10:00 am – 5:00 pm. If one does a little looking, one can still find a FREE Bus Tour to Laughlin, Nevada, including a free buffet lunch. A longtime favorite pastime of Las Vegas locals, this fun trip usually departs from one of the Las Vegas hotels around 8:00 AM and returns in the late afternoon. There is a free lunch buffet around noon; the rest of the time you are free to visit the local action. Yes everything is free, but don’t forget to leave your bus driver a nice tip.